You need to make a list of the virtual resources you’ll want to sell as part of your cloud business. For each of them, as noted in our business considerations, you’ll need to consider how you’ll want to charge for these resources. This includes what is the cost, what is the billing period – hourly, weekly, monthly, annually or a combination. Do you want to give it for free? Server resources – A virtual server uses processor and RAM resources from the compute node and stores data on the storage device. A virtual machine is capable of running most software that a physical computer can. A virtual server makes use of other resources in order to operate. Here are some examples of resources that are created when a customer spins up a server that you’ll want to charge against. NIC – In a physical server, a Network Interface Card (NIC) is a piece of hardware that allows a computer to communicate with a network. Virtual Machines have virtual NICs (vNICs) that fulfil the same role. vNICs handle network traffic that constitutes an important usage metric you may want to charge against. Subnet – A subnet is a subdivision of a network. This allows you to create networks within networks, so that groups of Virtual Machines (VM) can communicate with each other as though they were on the same physical network. Even if you’ll choose only to offer a single IP at a time, you’ll need to consider how you want this to be consumed and priced against. Disks – Individual block devices provisioned from a supported storage unit. Virtual disks are provisioned automatically by the system. Sometimes virtual disks may have limited IOPS capabilities enforced by the hypervisors, or they may be tied to a specific storage unit (e.g. a storage unit full of SSDs). Depending on your storage, you’ll need to consider how your disks allow you to offer resiliency and performance and at what cost as storage can get expensive fast. Snapshot – A snapshot is the saved state of a Disk (KVM and Xen) or Virtual Machine (VMware and Hyper-V) at a particular point in time. Snapshots are used to revert to previous states as well as to create an Image. Images – Templates of disks (like in the case of KVM or Xen4) or virtual machines (when using VMware or Hyper-V) that have been stored on the platform in a read-only format to allow customers to duplicate them repeatedly. Images may be base Operating System templates, or can contain software that is commonly used on your virtual machines, for example an email client or media player. You need to consider if you want to retain the ability to create image libraries to share with your customers and reseller or to transfer this capability to end users. Images are often also equipped with bootstrap scripts that customize the single deployment of each of them. They typically read metadata to set parameters like the administrator password or to kick off configuration management tools like Chef. Images are a great way to add value to a cloud, offering easy-to-consume applications that can be configured in automated fashion. Download our ultimate guide to cloud – Zero to Cloud – a one-stop guide to helping you whatever stage you might be at on your journey to or in the cloud. It includes more considerations for the business, technology, cloud management software, cloud deployment and customer acquisition. 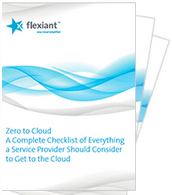 Download our Zero to Cloud checklist now.